For the second year in a row, Chip Kelly has tortured the Philadelphia press by not saying a word more than he has to during the off-season. Not surprisingly, this just makes reporters even more desperate to find out what the Mystery Coach is thinking. To be fair, Kelly hasn’t been quite as secretive as he was last year during all the DeSean Jackson speculation. He showed up unannounced at the March 11 press conference where reporters expected the team to introduce new quarterback Sam Bradford. 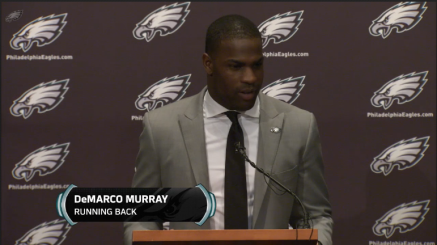 Then he did it again the very next day, after the team signed running backs DeMarco Murray and Ryan “One T” Mathews. This week, Chip was required by NFL rules to make himself available for an hour at the annual Owners’ Meeting, and he stayed for a solid 62 minutes. You have to keep in mind that he is a very fast talker — try transcribing his remarks some time — and he answers most questions instantly, so he can cover 5 times as many subjects in an hour as a typical drawling coach. All this sudden access was taking a starving man to an all you can eat buffet. Philadelphia reporters gorged themselves and are still digesting their sudden excessive meal, writing 2-3 articles a day on different tangents Chip jetted off on. Reporters in NFCE rival cities were mostly confused, calling the Bradford presser “odd” and struggling to “decode” his remarks. They were also mocking about some of his claims, for example that the Eagles had already been offered a first round pick for Bradford the day after they acquired him. On that score anyway, Chip has been verified by numerous reports which identified the Cleveland Browns as the team that offered their 19th pick overall to both the St. Louis Rams (pre-trade) and Philly. The irony is that Kelly has been pretty straightforward in his comments. Why did he trade for Sam Bradford? Because he thinks he’ll be a better quarterback than Nick Foles. Why did he let Maclin walk away? They offered $10 million, but weren’t prepared to match Kansas City at $11 million. The team was spending too much on offense and not enough on defense, and needs to get better on D, especially in the secondary. Why did he sign two free agent running backs? Because he wants to run more and didn’t like relying on LeSean McCoy so heavily, or allocating $11 million in salary cap space to Shady this year, which his agent wouldn’t renegotiate. None of this should be mysterious. I don’t know anyone who disagrees about the need to get better on pass defense. Kelly has always wielded a run-based spread offense, and his Ducks had two or more good RBs most of those years. Mathews and Murray and Sproles looks a lot like LaMichael and Kenjon and De’Anthony. McCoy ran the most snaps of any RB in pro football over the last two years, and he started playing young at 21 so he’s got more miles on him than his age would suggest. This is not to suggest that Chip was completely transparent on everything. He never speaks ill of players gone from his team. 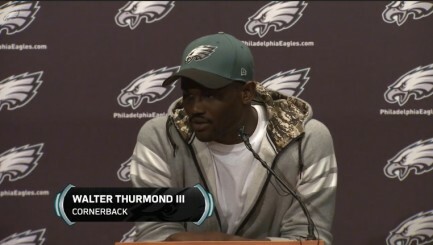 To this day he hasn’t said one bad word about DeSean Jackson. This last week, he avoided saying anything about LeSean McCoy being less than ideal, though owner Jeffrey Lurie was more blunt, saying Chip wanted north-south, one-cut runners and Shady danced too much. Kelly claimed it was just about money, and that’s not believable, but his sense of honor is a charming quirk from another era. One article reported that Shady did not buy into Chip’s heavy practices on Saturday’s, which would certainly move him up the “To be traded” list. Heck, reporters couldn’t even get Chip to say anything bad about Bradley Fletcher, who signed with New England. Kelly was also notably coy about trades and front office politics. Does he really have a choice? Reporters wanted him to say he forced Jeffrey Lurie to kick Howie Roseman upstairs and put Kelly in charge of personnel. Even if you think that’s true, it’s just diplomatically stupid. It would sell newspapers of course, because it would be outrageous and stupid to embarrass his boss. As for trading for Mariota, Kelly was maybe too direct about that possibility as it was. The pre-draft period is all about bluffs and smokescreens. No one believes Washington is going to draft Mariota, for example. Tennessee is bluffing they might too. These are just smart plays to increase the trade value of their picks. Kelly is playing a poker game with other NFL GMs right now. They don’t know if he’s any good at bluffing or not. John Barchard, a podcaster for Bleeding Green Nation, noticed a mannerism that Chip exhibited when talking about not wanting to trade Mariota on Wednesday. Alright the poker player in me can’t help it. 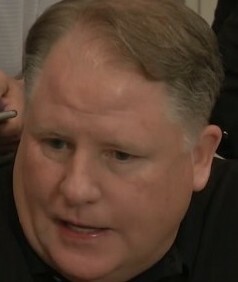 You can tell 100% when Chip uncomfortable answering a question. Lots of neck and ear rubbing. The question is, is Chip bluffing about not wanting Mariota? Or is he double-bluffing by faking a nervous tell, when he really doesn’t plan to trade? We’ll know in about a month.